Xbox 360 version reviewed. Review contains some light spoilers. 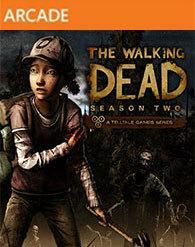 Telltale Games overcomes the hump as they turn out the fourth episode in season two of 'The Walking Dead.' 'Amid the Ruins' deals with the fallout of episode three's climactic, violent finale. Clementine's journey continues down a dark path. 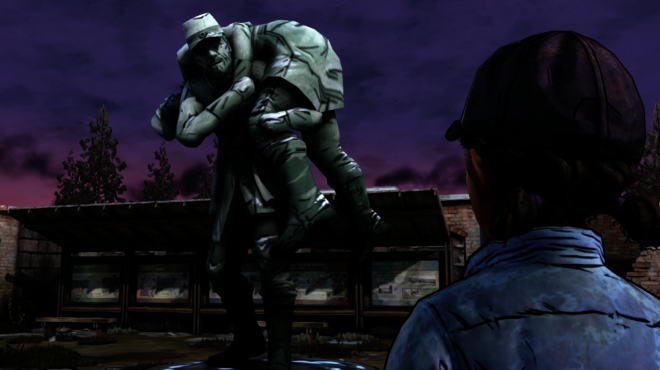 Can Telltale drum up the stakes for the fifth and final episode? There was a strong sense, in season two's first three episodes, that this was always going to be Clementine's story, that her beginning-to-end arc could possibly culminate in some grand piece on, perhaps, maturity, survivalism, or just which hats are best for dodging zombies. I'd settle for that last one after playing through 'Amid the Ruins.' I'd settle for anything close a point, really, since right now I'm completely lost as to how the developers plan on reconciling all the random turns I've just been subjected to. For one, Kenny has officially turned the corner from beat-up good guy to belligerent, bi-polar moron, conceivably alive this late into the apocalypse for reasons inhuman in explanation. Here's hoping season two turns into the most ambitious 'South Park' episode ever contrived, turning back into 'The Walking Dead' in season 3 (and I mean that statement in a lot of ways) just to prevent his return. There's a certain level of irrationality that you can force upon a character following a traumatic event. He just goes so far past it in this episode's opening sequence, a direct transition from the cliffhanger of episode three, that I actually found myself responding, as Clementine, to any Kenny conversation with as much hostility as possible. I wanted him to hate me as much as I hated him. So that's a bad start, plunging Clementine into a quick burst of emotionally charged violence, but then ripping you out of the sequence by a belligerent, unrealistically irrational character. They also make render your final decision in episode three completely pointless. It goes pretty poorly from there, only to be redeemed by a couple of surprising gameplay sequences (gasp, gameplay!) and an ending that veered as close to campy as the series has ever gone. I enjoyed it because, for the first time, it seemed like the writers cogently clashed with season two's general ineptitude. But, of course, that's more meta than it actually was. In non-meta reality, the bookends of this episode were forced poor facsimiles of a better zombie story. In the middle, though, we got to chase down a raccoon until he found his family. As I cooed and awed at the creature, it hit me, I was actually playing a game again. 'The Walking Dead' remembered that it's a game, unlike in that last episode when it was an interactive pop-up book, and there were a number of sequences, small and large of importance, that connected you back into the world in only a way a game can. I explored a Civil War museum which, in the shoes of Clementine, meant both very little and very much. She doesn't know much about it. She never will. She's living her own Civil War of sorts. You see what the gameplay did there? It made me create my own version of the story in=between those all-important plot points. The first three episodes of season two were so streamlined as to diminish the efficacy of the controller in your hand. Ironically, or perhaps not, as 'Amid The Ruins' refocused on gameplay, the story took a pretty scattershot series of turns. I have no idea where I am now. It seems like there's very little potential for season-wide payoff like there was in season one. And the decision I've made feel less and less important for it. There's Jane, who took her many walks with Clementine as an opportunity to pour out her soul. Her backstory is strong and her character, the loner type, is stronger. But she's essentially a one-note reflection of what Clementine might persevere to be, should she survive. That in itself shows as the only Clementine-centric turn of the entire episode. There's the pregnant Rebecca, who's pregnant, weepy, needy and, essentially, the only person who shows emotion aside from clap-on monster inside of Kenny. The young Sarah, Clementine's antithesis, does get an interesting scene, but one of zero value in the posterior. Every other character flows in and out of scenes with the importance of a fruit fly in a cornfield, the consistency of decision-making and consciousness to match. Nobody feels real, aside from Clementine, who's you. A number of deaths, which might've been meaningful to both the characters and player, are washed over like the tide on a beach, not an impression in its wake. Again, I was more sadistic in my decision making as a result, like I was in a hedge maze that was guaranteed never to end. This character dies, we move on to the next puzzle, then another character dies, take a left turn into the finale were a totally randomized conflict arises for the sake of cliffhanger. Oh, right, and make Clementine do the dangerous stuff, because she wouldn't be allowed to ride a roller coaster at Six Flags. And that makes sense. 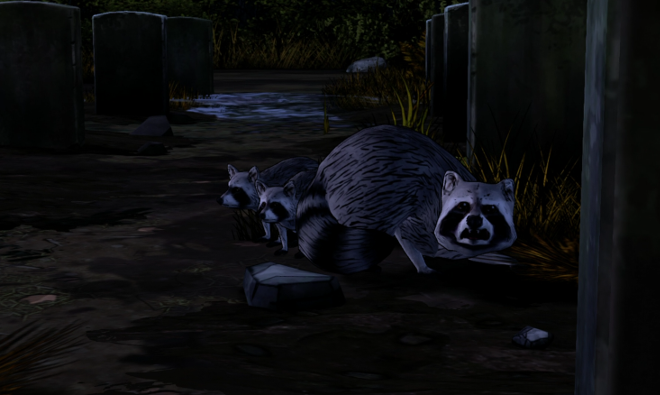 Telltale had a bit of fun with the environments this time around, plunging our group of characters into a National Park and a Museum. The opportunity for imagery and quiet consideration did not go wasted. That said, we're still walking through a whole bunch of cel-shaded forest. The facial animations are also quite lively, as usual. The voice acting remains emotive in coherence with the script. The yelling and the weeping all hit their highs and lows, even if the words in-between feel empty. More than ever, however, the music seems to be taking a back seat. The rumbling drums and yearning violins pique here and there, but it's not an element that ever breaks open a scene. 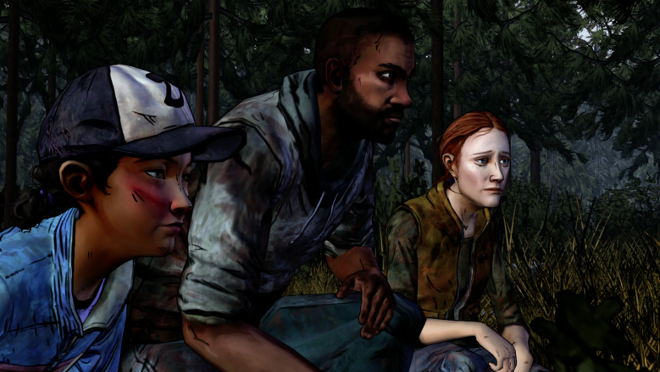 Story altering-decisions make 'The Walking Dead' the most replayable story in history. Still, coming onto the fourth episode now, restarting means going back all the way to the beginning. You'll have to wait until the season's finished before logically doing that. Comparing your decisions from episodes past with the community remains the best post-game activity in story-based games. I was surprised at how many people went with me on the murder, death, kill option this time around.